The faculty and staff of the Andruss Library at Bloomsburg University of Pennsylvania – facilitate and advocate for the exploration and creation of knowledge for personal and professional success. Newspapers have been published in Columbia County since the 1820s, one decade after its founding in 1813. 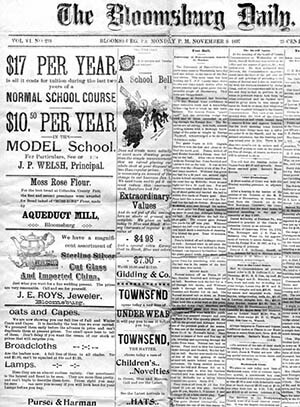 As the only initial sources for its citizens of national news and best providers of coverage for local events, these newspapers comprise an indispensable record of the history of the area. The newspapers featured in the exhibit are the Columbia County Republican, Bloomsburg Daily, Berwick Enterprise, and Morning Press, dating from 1864-1970. The events covered locally include the trial for a Civil War conspirator, a Bloomsburg State Normal School baseball game, the Sesquicentennial Celebration of 1952, and the Bloomsburg Fair. National events featured are the end of World War II, the beginning of the Korean War, the assassination of John F. Kennedy, and the first landing of men on the moon. The display is currently installed in the flat cases on the third floor of the Andruss Library. The exhibit will be on display until October 30, 2015. The Harvey A. Andruss Library (named for a former Bloomsburg University president) provides access to more than 450,000 volumes of books, bound periodicals, and government documents; 2 million microforms; 50,000 journals, magazines, and newspapers in both print and electronic format; and nearly 150 online databases. The technologically designed building provides more than 900 study spaces with more than 200 having computer access to the library's and worldwide information resources. There are more than 30 group study rooms, photocopying rooms, and a faculty/graduate student study. The building also offers lounge and exhibit spaces and a University Archives and Special Collections Reading Room. Wireless computer access is available in all areas of the building. The library and its facilities are open to the general public. The Circulation Desk is located on this floor along with newspapers, the Popular Reading Collection, Microfilm & Microfiche Collection, accommodative services, color printers and scanners & more. Reference Librarians’ offices are located on this floor along with the Current Periodicals, Juvenile, Curriculum, Reference and Government Documents Collections & more. Administrative offices are located on this floor along with the Archives/Special Collections Room, the General Collection A-N, specialized computers & more. The TALE Center is located on this floor along with the Faculty/Graduate Student Study, Bound Periodicals and the General Collection P-Z. To check out books or use our electronic resources in the Library, you will need to apply for a PA Resident Borrower's Card. The Library is not permitted by its licenses to provide alumni with remote access to its electronic resources. This means that unless you currently work for Bloomsburg University or pay BU tuition to take for-credit classes, your borrowing privileges are those of a PA Resident. If you are a student at another university, for example, Marywood University, then you will have complete access to your home institution's online electronic library resources using their off-campus access links as well as their interlibrary loan services. You may ask one of our librarians for assistance in accessing your university's library's resources.